Property Info: 4BR, 4.5BA Gulf-front Home w/ approx. 3900 sq. 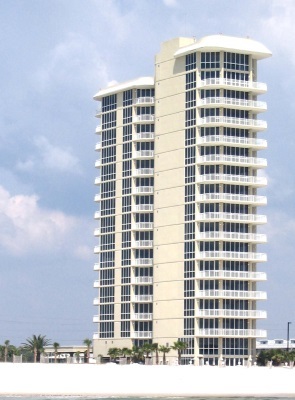 ft.
Oceania condominium is beachfront resort real estate in Gulf Shores Alabama. This luxury condo offers 1 unit per floor w/ elevator access directly to your private foyer. This split floor plan has a Gulf front Living, Dining & Kitchen area Enjoy incredible 360 degree views of the Gulf, Lagoon & Gulf Shores from the 9th floor wrap around balconies. Oceania Condos in Gulf Shores AL. Gulf Shores Alabama is known for the sugar-white beaches, fresh seafood, championship golf courses, charter fishing trips, wildlife areas, arts, museums and historic sites which are just a few of the options has in store for visitors. Gulf Shores, with it's warm weather, is a water-sports paradise. Surrounded by back bays and rivers, there are many opportunities for outdoor recreation and fresh seafood. This area is the perfect getaway and has something for everyone. Choose from a variety of Gulf Shores accommodation ranging from condo rentals, to beach resort houses and gulf-front hotels. According to the U.S. Census Bureau, the city has a total area of 28.0 square miles, of which 23.2 square miles is land and 4.8 square miles is water. Find the perfect Gulf Shores resort property or permanent residence and discover why the Alabama Gulf Coast beaches are so popular.